Providing an evidence-based, practical guide to care in all areas of children's pain management, Managing Pain in Children offers nurses and other healthcare professionals an introduction to the skills and expertise to manage children's pain effectively. This fully-updated second edition first explores the relevant anatomy and physiology of children, the latest policy guidelines surrounding pain management and ethical issues involved in managing children's pain. Various pain assessment tools available for children and non-drug methods of pain relief are then explored and applied to practice in relation to acute pain, chronic pain, palliative care and the management of procedural pain. 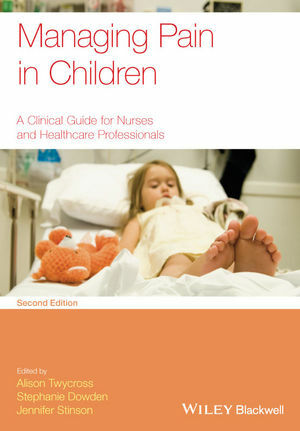 The evidence base, assessment techniques, pain-relieving interventions, and guidance for best practice in both hospital and community settings are covered throughout, making this title an ideal resource for all nurses and healthcare professionals working with children. Alison Twycross is Head of Department of Children's Nursing and Reader in Children's Nursing, London South Bank University, London, UK. Stephanie Dowden is Clinical Nurse Consultant (CNC) for Paediatric Palliative Care at Princess Margaret Hospital for Children in Perth, Western Australia. Prior to this she was CNC in paediatric pain management at the Royal Children’s Hospital in Melbourne Australia. Jennifer Stinson is Post-Doctorial Research Fellow and Advanced Practice Nurse for the Chronic Pain Programme at The Hospital for Sick Children in Toronto, Ontario, Canada.